Who has time for breakfast in the morning? All the time people tell me they either don’t eat breakfast or they’ll just eat something on the road during their commute. What is the solution to the on-the-go or no-breakfast-at-all morning routine? Let me tell you about the homemade, healthy breakfast bar. But first, why is breakfast the most important meal of the day? Without it, your blood sugar will spike quite high and lead to its trademark fatigue, weakness, tiredness, trouble concentrating, headaches, and an increased thirst—often for caffeine to help contribute to that tiredness and fatigue. Basically, it’s just one big circle of problems. Luckily, breakfast can be simple and chock full of nutrients that help and stabilize blood sugar levels and regulate insulin resistance. Some of these blood sugar-regulating nutrients include fiber, protein, B vitamins, and antioxidants like vitamin C and vitamin E.
In the past, I’ve put an alternative spin on breakfast with my recipes for chia pudding, smoothie bowls, and healthier gluten-free versions of muffins, and pancakes. Although those are great quick options for a healthy breakfast, today I want to share healthy breakfast bar recipes that are the perfect way to get nutrition in the palm of your hand—literally. 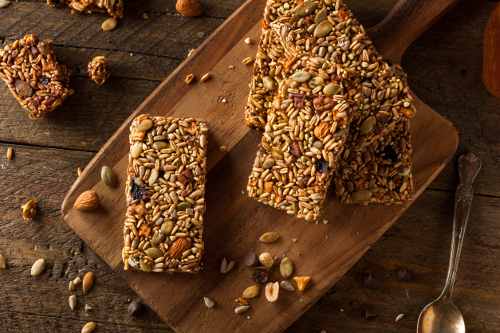 Granola or protein bars are often what most people think of when then hear “breakfast bar.” They are easy to find at most grocery stores, and often marketed as a health food. However, most of the time, they are among the unhealthiest things you can put into your body. Many of them are loaded with sugar, genetically modified canola oil, high-fructose corn syrup, and other toxic ingredients that increase your blood sugar, and can potentially lead to other diseases. Making your own handheld breakfast snack is the way to start your day on the go. That way you control what ingredients you put into your body. The good thing about the following healthy breakfast bar recipes is that you can make them on the weekend and have enough for the entire week, or more. Here are five vegan healthy breakfast bar recipes to give you a variety of options. Let’s start off with a granola bar that is loaded with nuts, seeds, and gluten-free grains. This unique combination of hemp seeds, almond butter, cinnamon, chia seeds, oats, chocolate, and more will certainly provide you with lots of fiber and other good stuff to start your day. This breakfast bar recipe will make 12 bars and stores in the fridge for two weeks or in the freezer for a month. Line a nine-inch square cake pan with two pieces of parchment paper, with one going each way. In a large bowl, combine the oats, hemp seeds, rice crisp cereal, coconut, sesame seeds, sunflower seeds, cinnamon, chia seeds, and salt. In a small saucepan, stir together the almond butter and brown rice syrup, and combine well. Cook over medium to high heat until the mixture softens and bubbles slightly, remove the pan from the heat, and then stir in the vanilla. Pour the almond butter mixture over the oat mixture, using a spatula to scrape it all out of the pan. Stir well with a large metal spoon until all of the oats and cereal are coated in the wet mixture. Allow the mixture to cool slightly before folding in the chocolate chips. This will prevent them from melting. Transfer the mixture to the prepared pan and spread it out into an even layer. Lightly wet your hands and press down on the mixture to even it out. Use a pastry roller to compact the mixture firmly and evenly. This will help the bars hold together better. Press down on the edges with your fingers to even out the mixture. Place the pan in the freezer uncovered and chill for 10 minutes, or until firm. Lift the oat square out of the pan, using the parchment paper as handles, and place it on a cutting board. With a pizza roller or serrated knife, slice the square into six rows, and then slice them into 12 breakfast bars. Wrap the bars individually in plastic wrap or foil, and store them in an airtight container in the refrigerator for up to two weeks. You can also store them in the freezer for about a month. Like the saying goes, An apple a day keeps the doctor away. Apples are full of fiber, vitamin C, beta-carotene, and other important nutrients that make them great for digestion and heart health. Combine apples with other nutrient-dense ingredients like shredded coconut, ginger, and nut butter, and you have an amazing breakfast bar that will give you lots of energy and balance blood sugar. The polyphenols in apples are also great or regulating blood sugar and preventing diabetes. The ginger and cinnamon are also anti-inflammatory spices that provide lots of flavor in every bite. The following breakfast bar recipe makes 12 bars, and they will keep for up to 10 days in the fridge, or four months in the freezer. In a large bowl, combine all ingredients, except for the pecans, until mixture is well combined. Press the mixture into a parchment paper-lined 11×7-inch baking dish, and bake for 40 minutes. Remove from the oven, and immediately press the pecans into the top of the breakfast bars. Serve warm. Who doesn’t love carrot cake? I bet you wish you could take some with you everywhere. Well, now you can with a tasty carrot cake breakfast bar. Carrots contain a phytonutrient called falcarinol, which could help fight colon cancer. Carrots are also loaded with fiber, which is great for digestion and blood sugar control. Combine the carrots with anti-inflammatory spices like ginger, cloves, nutmeg, and cinnamon, and have yourself quite the morning treat. The following healthy carrot cake breakfast bar recipe makes 18 bars. That’s good for over two weeks, or there’s enough for the whole family for a week. Soak the dates in water for 30 minutes. Place the nuts and sunflower seeds or hemp hearts in a food processor, and process until finely chopped. Drain the dates, and add them to the food processor along with two cups of the carrots, zucchini, apple, and salt. Process for about one minute, until you get a puree. Transfer to a large mixing bowl. Using a clean coffee or spice grinder, grind the flaxseeds finely. If you don’t have a grinder, feel free to use pre-ground seeds. For the nut and carrot mixture, fold in the ground flax, the rest of the carrots, and currants, spices, and coconut. Stir until you have a cookie batter consistency. Preheat the oven to 150° Fahrenheit. On a parchment-lined, rimmed baking sheet, spread the batter evenly to form a quarter-inch-thick rectangle. Place in the oven for two hours. Invert the pan onto a cutting board and remove the parchment paper. Cut into 4×2-inch breakfast bars. Return the bars to the lined baking sheet, and place pan back into the oven for about four more hours, or until the bars are firm like a moist cake. This breakfast bar recipe is the only one that is not baked. Since these bars are no bake, you won’t have to worry about the size of the pan you use. Basically, the larger the pan, the thinner the bar, and the smaller the pan, the thicker your bar will be. The choice is entirely up to you. The following recipe is loaded with superfoods like shredded coconut, dried cranberries, rolled oats, pumpkin seed protein powder, nut or seed butter, cinnamon, sunflower seeds, chia seeds, and more. The recipe makes 12 breakfast bars that will help you start your day on the right track. Combine all the ingredients in a large bowl, and mix well. Press into a nine-inch square pan, and refrigerate for four hours. Cut into 12 squares, and enjoy. It will store nicely in the refrigerator or freezer. Who said jam was just for toast? Strawberry jam is also great for this next breakfast bar recipe. Sure, the jam makes this recipe more of a treat than any of the other breakfast bars provided in this article; however, as long as you choose homemade jam or refined sugar-free jam, you should be good. The oats, coconut oil, and sunflower seeds combine to give you something to be desired and enjoyed. The recipe will make 12 to 16 breakfast bars that can be stored in an airtight container in the refrigerator for several days, or wrapped and stored in the freezer for four to five weeks. Preheat the oven to 350° Fahrenheit. Line a nine-inch square pan with parchment paper. In a food processor, combine the oats, sunflower seeds, and salt and process until you have coarse flour. In a small pot, melt the coconut oil over low heat and remove from the heat; then, whisk in the brown rice syrup, maple syrup, and sunflower seed butter until well combined. Pour the wet mixture over the oat mixture in the food processor and process until the mixture comes together for about 10 to 15 seconds. The dough should feel heavy and oily, and there shouldn’t be any dry patches. If there is, process for another five seconds or so. If still dry, add a teaspoon of water at a time and process until it comes together. Set aside one and a quarter cups of the oat mixture for the topping. Crumble the remaining oat mixture over the base of the prepared pan in an even layer. Starting at the center, push down with your fingers to spread out and pack down the crust. Press the dough down tightly, and even out the edges with your fingertips. Prick the crust with a fork about nine times to allow steam to escape. Bake the crust for about 10 minutes, and remove from the oven. Let it cool for five minutes. If the crust puffed up while baking, gently press down on it to release the air. Spread the jam in an even layer over the crust, and crumble the reserved oat mixture evenly over the jam. Bake uncovered for 14 to 18 more minutes, or until the topping is lightly firm to the touch. The topping will not turn golden, and it will remain the same shade before baking. Let cool on a cooling rack for 45 to 60 minutes. Lift out the slab and slice into breakfast bars. Homemade Breakfast Bars Are Good for You! For the person that often avoids breakfast, the provided healthy breakfast bar recipes will help give you energy for your day and regulate blood sugar levels. On top of that, they are made with love—because you made them. And, they are also free of refined sugar and other toxic ingredients that increase your blood sugar. The good part about homemade healthy breakfast bars is that you can make the provided recipes in batches so that you can store them in the fridge or freezer. As a result, you get to enjoy breakfast every day of the week, which likely sounds pretty good for people that have a hard time eating at all in the morning. Daniluk, J., “Hot Detox: A 21-Day Anti-Inflammatory Program to Heal Your Gut and Cleanse Your Body (Toronto: HarperCollins Publishers Ltd., 2016), 150, 154. Liddon, A., The Oh She Glows Cookbook: Vegan Recipes to Glow from the Inside Out (Toronto: Penguin Canada Books Inc., 2014), 215-216. McCarthy, J., Joyous Detox: Your Complete Plan and Cookbook to Be Vibrant Every Day (Toronto: Penguin Group, 2016), 119. Liddon, A., Oh She Glows Every Day: Quick and Simply Satisfying Plant-Based Recipes (Toronto: Penguin Canada Books Inc., 2016), 45-46. Mateljan, G., The World’s Healthiest Foods: Essential Guide for the healthiest way of eating (Seattle: George Mateljan Foundation, 2007), 230, 434. Vien, A., “Granola Bars: One of the Most Absolute Worst Foods You Can Eat,” LA Healthy Living, Aug. 25, 2015; http://www.lahealthyliving.com/health/granola-bars-one-of-the-most-absolute-worst-foods-you-can-eat/, last accessed May 26, 2017.